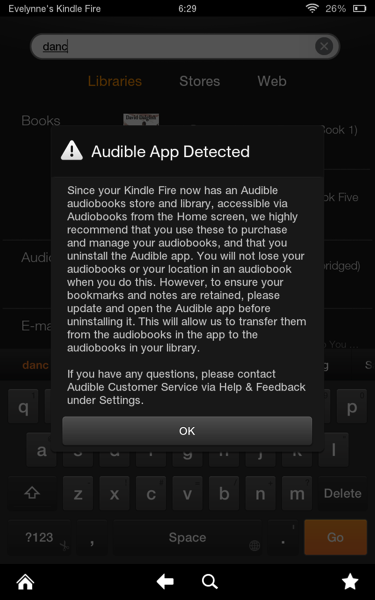 Kindle Fire in Canada and Audible – Progress! This evening when I went to download my latest Audible read to my Canadian Kindle Fire, I got a big surprise. A message popped up advising me that I could now listen to and shop for audiobooks natively from my Kindle Fire and that I should uninstall the Audible app. I did so and found that my audiobook played in a new, integrated player. I also noticed that individual Audible audiobooks now appear in my carousel and can be added individually to the Favourites drawer rather than just the Audible app itself. Being a Kindle, of course they’re trying to sell you things, and I see that when I view an audiobook in the carousel, I now get recommendations for other audiobooks. Searching the Kindle is now integrated with my Audible library. Searching for an audiobook will find it in your Audible library ready for downloading. It seems that they’re not quite there yet with the integration though. Audiobooks doesn’t appear in the top menu bar, and clicking on one of the audiobook recommendations doesn’t take you anywhere yet. Clicking on Shop still only shows three options available to Canadians: Books, Games and Apps. At this point Audible books are still not showing available from Amazon.ca and Immersion Reading doesn’t yet work. However, the arrival of the integrated app for Canadians and the indication that we will be able to shop for them would strongly suggest that the rest of the integration is not far behind. Personally, I’m really excited about this development – the lack of Audible integration for Canadians was my one major disappointment about the Kindle Fire. I really look forward to future developments. What developments would you like to see for the Kindle Fire?